A small 6"x6" piece of artwork from one of our hospital visits. This artwork will come from the surface of one of the pianos the kids paint. Ellen Project: Songs of Hope CD. CD contains original songs written by various artists, from different genres, for one purpose: to inspire hope for sick kids. Songs of Hope CD and an ultra-comfortable, Ellen Project t-shirt. Songs of hope CD, Ellen Project t-shirt, and a ticket to the CD release party. Release party location to be determined, but will be somewhere in St. Paul, MN. Four Songs of Hope CD's, four Ellen Project t-shirt's, and a VIP table for four people at the CD release party. Release party location to be determined, but will be somewhere in St. Paul, MN. Your name or business listed on the Ellen Project: Songs of Hope CD as an executive producer. Also receive eight copies of the album, eight t-shirts, and a VIP table for eight people at the release party. Location for release party to be determined, but will be somewhere in St. Paul, MN. 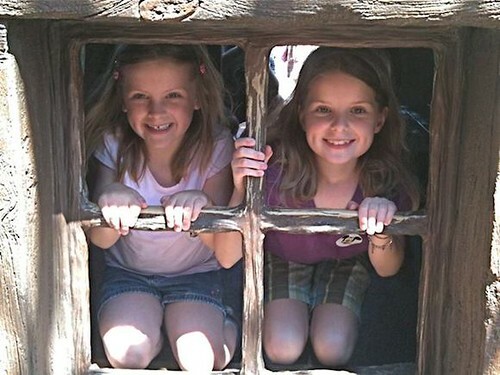 Molly was 6 years old when she was diagnosed with leukemia. She loves school, playing with her sister, taking family trips, and is the sweetest girl we know. She is now 7 and is fighting one of the hardest battles. Her sister, Ellen, is two years older and has been by her side the entire time. They are constantly thankful for the time they can spend together. Each one is comfortable in their respective role as “big” or “little” sister. Ellen loves to share things she knows, and Molly is a willing audience. Molly loves it when Ellen reads her favorite book to her or works with her on art projects. Ellen has a lot to balance in her life. While most 5th graders get to focus on sports, school, and being kids, Ellen has to carry the weight of Molly’s illness as well as not getting the same level of attention at home as she did in the past. When Ellen was invited to join Keys 4/4 Kids artist/mentor program called Pianos on Parade, she jumped at the opportunity. Her mentor, Carol, was a perfect match, and Ellen thoroughly enjoyed the whole experience of painting a piano. But Ellen didn’t want her sister to miss out on the fun, and her dedication to bring Molly in on the project inspired Keys 4/4 Kids to do more. With the help of Love Your Melon, Keys 4/4 Kids organized an event at Children’s Hospital of Minneapolis where Molly was being treated. 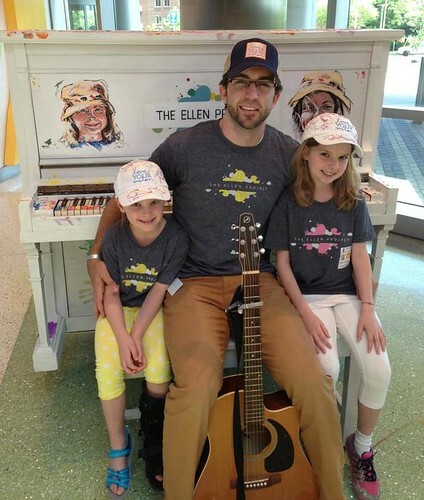 Ellen brought the piano painting project to Molly and other sick kids on June 18th, 2013. For Ellen, it was a chance to show Molly what she’d been up to, and both of them enjoyed sharing techniques and stories with other kids (and adults) who helped paint the piano. Both girls loved the event and expressed a desire to share this with other children in the hospital. This desire inspired the creation of The Ellen Project, a new initiative by Keys 4/4 Kids that brings piano painting projects and bedside mini-concerts to sick kids and their families, and the reason we’re asking for your help today. The Ellen Project: Songs of Hope CD is a collection of songs written and inspired by musicians who have participated in Ellen Project events at Twin Cities hospitals. The theme song of our video, “Someday”, was written by local musician Michael Lane and will be one of the songs on our CD. The songs encompass a wide collection of genres and musical styles, but each one has the same purpose: to inspire hope for kids facing illness and hospital stays. The CD is being produced by former keyboardist of the band Atmosphere, Erick Anderson. 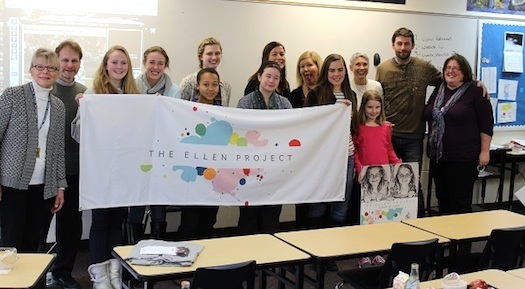 By supporting The Ellen Project, your donations will allow us to give out CDs to the kids we visit in hospitals as part of The Ellen Project FOR FREE. Each CD is a lasting reminder of the concert. The collection of songs will continue to inspire the families and children while giving them hope through treatment and recovery. Each donation and reward are tax deductible through our Keys 4/4 non-profit. You will receive a receipt if we reach our goal at the end of the campaign. Help us to get there! Kickoff With Mounds Park Academy! Keys 4/4 Kids is a nonprofit 501© 3 that accepts donated pianos. After the pianos have been restored by piano technicians, they are sold to the public. 100% of profits from these sales support programs related to our mission: inspire young people to believe in themselves through the arts and mentorship. Keys 4/4 Kids was founded fourteen years ago by Newell Hill. At the time, Newell was nineteen years old and a freshman at the University of Minnesota. After classes, Newell volunteered his time teaching music and art to kids in an after school program in North Minneapolis. Newell saw the power and potential of the arts to build self-esteem and confidence in our young people. He needed a way, however, to pay for musical instruments, staff, and supplies for the program. Over a summer, Newell taught himself how to fix old pianos began collecting and selling them out of his parents’ basement. During the first summer, Newell raised a little over $10,000. The business of collecting, restoring, and selling old pianos continued to gain momentum. Keys 4/4 Kids has since expanded to Chicago and Kansas City and currently has annual revenues exceeding 1 million dollars. Newell is the executive director of this nonprofit and continues to use profits from these piano sales to inspire young people to believe in themselves.